Promotional pet-themed items are a no-brainer for those who own pet stores, offer training services, run kennels, or promote other pet-related businesses. Browse through our huge range of personalized pet products. We guarantee you’ll discover more than a few useful ways to market your brand. Pet owners are a special, niche audience because they typically adore anything printed with their favorite animal or designed with their pet in mind. No need to “paws” for thought on this one – have a look for yourself! Throw your customers a bone - with this bone shape custom dispenser filled with pet waste disposal bags. Promotional Dog Bones treats in a clear header bag. 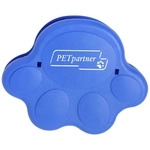 Paw shaped promotional litter scooper for cleaning cat box. Keep track of your pets and your logo with these full color custom pet leashes. Promotional dog bones treats as a reward for the unconditional love our dogs give! Keep your dog or cat looking and feeling cool with this custom promotional pet bandana. Great design all in one, smart scoop and bowl. Keep your pets feeding area clean and neat with these pet bowl custom mats imprinted with your full color logo. Promote your company logo and man's best friend with this eco-friendly certified organic cotton promotional pet collar. Custom Bird Feeder is made of polypropylene and uses a 2 liter bottle (not included) filled with bird seed. These adorable puppies and kittens will truly get to the heart of your customers in this eye-catching Puppies & Kitties 13-Month Appointment Custom Calendar. Promote your company logo and man's best friend with this fully dye sublimated promotional pet collar. Promote your company logo and man's best friend with this fully dye sublimated promotional dog collar. Clean up after man's best friend during the day or night with this light up custom dispenser. Durable & Safe! This Pet Chew Toy Custom Tennis Ball was specifically made for your pet! It offers a low bounce and was designed to hold up to the wear-and-tear of your pet whether you're playing at the park or in your own back yard. Mini Collapsible Custom Pet Bowl - 16 oz. Clip this collapsible custom pet bowl to your dog leash when going for walks so can ensure your pet stays hydrated or for a quick snack. Keep your cherished pet secured and close by with these full color heavy duty pet custom leashes imprinted with your full color logo. Your favorite pet will stay safe and close by with these full color heavy duty pet custom leashes imprinted with your full color logo. This disposable diaper & pet waste disposal bag promo dispenser is a must have for parents on the go and responsible pet owners. Full Color Mug Stuffer Promotional Dog Bones - 4 oz. Promotional Dog Bones treats in a mug stuffer bag. Keep a grip on your pet food or promote your pet project with this Custom Animal Paw Memo and Bag Clip! Full Color Promotional Dog Bones Snack Pack - 1 oz. Promotional Dog Bones treats in a promo pack are a great giveaway in a busy veterinary office! This Logo Imprinted Reflector easily attached to your belt loop, zipper or pet collarfor maximum reflection, safety and identification. Clean up after man's best friend with this fire hydrant promo dispenser that includes 10 biodegradable waste bags. Are you looking for a promotional item that will remind your clients of their favorite furry friend? Personalized pet gifts are a thoughtful and useful way to promote your brand to clients with cats, dogs, or other pets. Promote your brand to pet lovers of all kinds with custom pet products. Promotional pet items are not just for pet stores and groomers. Almost all businesses have employees with some kind of pet at home. Look through our selection of toys, treats, leashes and collars, dog tags and more! Personalized pet products are as much fun for customers to receive as it is for their pets. ePromos carries many different pet items that can be printed with your company logo. We carry a vast assortment of personalised dog gifts, as well as items for cats and birds. Any vet office or groomer can hand out custom tags for their furry clients that will showcase their company logo. Give or sell these items to your local city hall or community business to spread awareness about pet registration and local pet guidelines for public spaces. There are so many opportunities to show your clients how customized pet products can help build their brand! Even pet friendly offices or hotels can benefit from promotional pet items. Hand out water bowls branded with your logo or small treat packets to remind customers that you not only care about them, but also about their pets! Ask a brand consultant today about your options for personalized pet items!